This is a blog about preparing tasty, healthy, and easy food with a powerful blender. I was exposed to the world of high-performance blenders early. My dad got a Vitamix when I was a kid and he used it often to make breakfasts of “total juice” smoothies and pancakes or waffles with freshly ground whole grains. In 2005 he gave me my own Vitamix. Since then I’ve enjoyed using it to make smoothies, fresh flour, hummus, and much more. I was inspired to start JoyofBlending.com after describing recipe ideas to family and friends, and I started thinking it would be nice to have a reference to point to. I hope this blog inspires and motivates all of us to try new blender ideas. I hope you enjoy the blog, and if you have any comments or suggestions please don’t hesitate to comment or contact me directly. 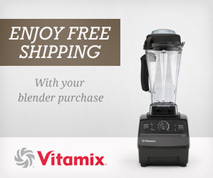 I favor Vitamix blenders, but I’ve also used Blendtec blenders with good results. Some of the recipes on this site will work with run-of-the mill blenders, but I can’t necessarily vouch for the results. well, i got my new vitamix pro 500 (it says 6300 on the label) last week. it is the refurbiushed one. i set it to smoothie and off it goes doing what it does best. i am so happy. in the past i have had waring bar blenders, an oster blender, and kitchen-aid blenders. nothing comes close. my second day of doing smoothies and i am ecstatic. so smooth and so delicious. they just go down so well. i doing 2 smoothies a day with a meal (and a small meal as well aka snack). oh, i did a strawberry daquiri (with rum) and the bars i have been in couldn’t get the consistency anywhere like this vitamix does. thank you vitamix!!! I found a 2100(?) at a yard sale. I’m guessing at the model because the name plate is missing. However the Vitamix name and model number was on the bottom of the machine. I’ve found that model 479003 may be a 2100 or a 2200, home or commercial respectively. Since the case is green enamel, not stainless or chrome, I suspect that this on the home model. So far, about one-half hour, I’ve not found a manual for it, nor anything that I could take as specific to the model. So, thought that I’d subscribe to your newsletter and do some experimenting with recipes. Who knows, I may have a diamond in the rough? I have one just like the one you described, same model number.Mine still has the tag and it says Vita mix kitchen center 2200. My Dad bought this blender at the Indiana State fair in the mid 70,s.Still works well. Just made a raspberry smoothie , Fantastic.